Need a closer look at the versatile, healthy Chia Seed? Check out the chia with this great photo gallery. See the seeds, then see great examples of what you can do with them when you use chia in fun recipes. Chia seeds are very small. They're only a little larger than a poppy seed. 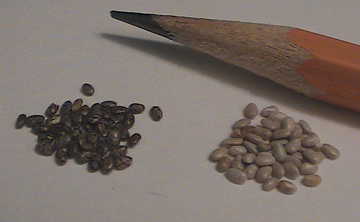 Every seed has a tiny pattern on the shell, of slightly different colors. Chia has 2 main colors 'white' which is mostly gray, tan & white, and 'black' which are actually dark brown, dark gray & black. Chia will sprout if you plant it. You can eat the sprouts, so long as they are fresh and you know that they are free from pesticides or soil contaminants. The sprouts are healthy too! They have a slightly spicy flavor. Chia will stay fresh for 2 whole years if you keep it in a cool, dry place. Our bags are ideal because they have an easy, re-seal-able top! Here, you can see the patterns on the outside of the seed shells. Each one is different. The water to the right is chia gel. It only takes 10 minutes to make chia gel! All you need to do is wet the seeds, and mix to prevent clumping. Chia gel has no flavor, when you make it with filtered water. It can help to blend or sometimes magnify the flavors of food you add it to. 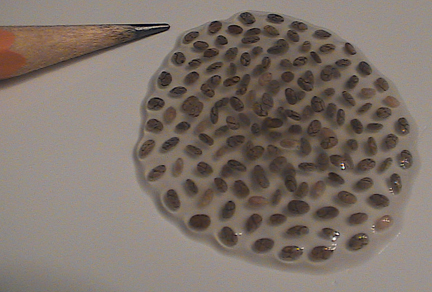 Chia can absorb 9 times its own weight in water (or other liquid) The fibers on the outside of the seed shell (they're clear, you can't see them here) hold the water in, and create the gel you see. This is called soluble fiber. It feeds probiotic (healthy) bacteria in the digestive system. 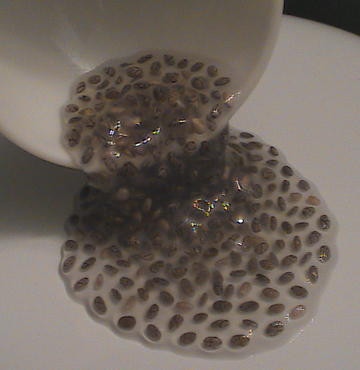 Chia gel can be poured or scooped. You can use it to replace butter in certain recipes. Chia gel won't change the taste or texture when you use it, and you can replace up to half the fat! 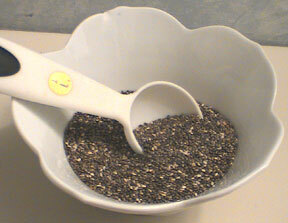 It's so handy & because 1 tablespoon of dry seeds makes 9 tablespoons of chia gel, it's a great value too.